This is the story of a lord who mistook a diamond for a pebble, and threw it away. Stories are displayed in reverse order. 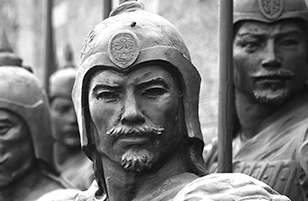 Ba Renzhong screamed a war cry as he charged like a rhino into the midst of the bandits. 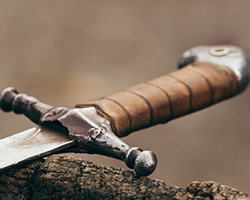 A spear jabbed at him, but he ducked beneath it and tackled the brigand to the ground. His elbow knocked the criminal witless, and Ba grabbed the spear for himself. Seeing that he knew what he was doing, the other bandits surrounded him in a circle, swords and spears ready. The outlaws looked at one another, eyes wide in fear. But none fled, for they had numbers on their side. Let this be a lesson to you, reader. A dozen sheep are no match for a single lion. Numbers mean nothing against skill. Ba thrust his spear left and right, every stroke spraying red. The bandits’ blades came his way, but he dodged low and parried high. For all their attacks, the miscreants didn’t even manage to cut his robe. In a few moments, only three of them were left. 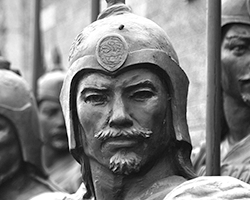 One threw down his sword and ran, but Ba hurled his spear and impaled the criminal, pinning him to a tree. Ba Renzhong hobbled through the wide streets of Tiangjin. Guards marched ahead and behind him, and he was shirtless so that the people lining the streets could see the marks of flogging ripped into his back. A heavy wooden cangue had been locked around his neck and both wrists. Until recently, he had been Lord Ximen’s general, and presided over a number of exile sentences himself. Despite being demoted to colonel, Lord Ximen had decreed his journey to Ganyang would be made as wretched as possible. A few members of the crowd booed and jeered, but most watched in silence. “Ba Renzhong! You saved my son from bandits! Gods protect you!” a woman cried out. Ba smiled, and looked for her, but she ran away before the guards could find her. Eventually he came to the gate from which the road to distant Ganyang began. A border province a hundred days away and full of criminals and barbarians, Lord Ximen had exiled him there as a death sentence. Ba looked this way and that, but there was no sign of his little brother, Ba Jiang.